It was chaos at the Boroko shopping centre area in Port Moresby on Friday morning when looters rushed in to steal items in shops after fire broke out and burnt four buildings, including a pharmacy. 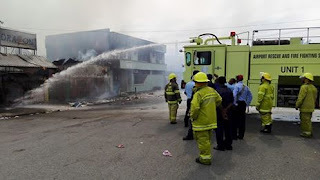 According to a security guard who was there at the time when the fire started, claimed the fire started early in the morning from the Papindo shop located at the line of shops along the Tabari place. The fire then spread to a fast food outlet that was partially burnt yesterday in a fire as well, and then to Johnston Pharmacy and the Dragons Pokies place next to it. Looters took advantage of the situation and broke into the CHM electronic Shop as well, which wasn’t on fire and stole electronic goods before police came in to prevent anymore looting. Meanwhile, fire fighters from the city and the airport arrived just in time to save the neighbouring shops from being burnt down as well. Police were there as well to keep looters away from breaking into other shops nearby.